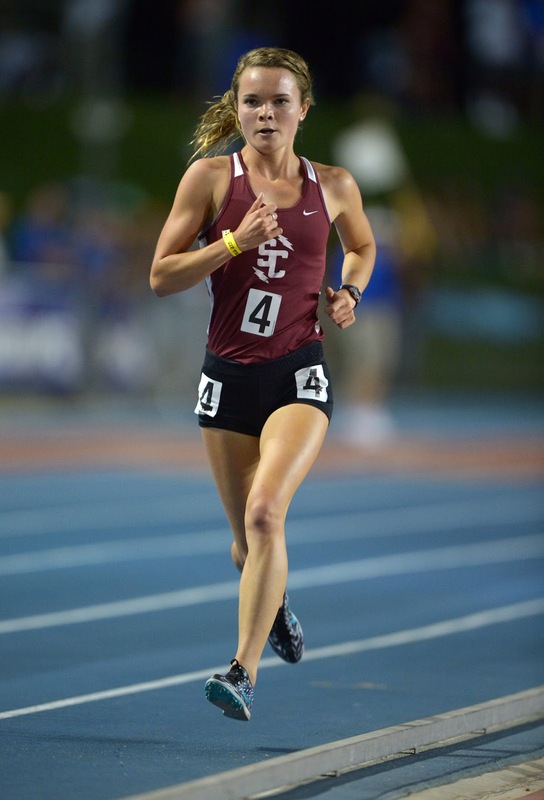 Today we chat with Santa Cruz senior runner, Cate Ratliff (photo courtesy of Kirby Lee and imageofsport.com). This past Saturday, Ratliff raced at the Earlybird Invitational and with the fortune of cooler weather, she was able to break the old Toro Park course record previously held by Tori Tyler of Gunn (17:16 in 2004). Ratliff ran 17:00 to establish the new mark. During the summer, Ratliff ran the Wharf to Wharf race and finished 7th overall in the female division with a 33:54 mark for the fast 6 mile course. This past Track and Field season, Ratliff won the CCS 3200 meter race with a time of then personal record of 10:27.10. She finished in 9th place at the CA state meet with a time of 10:25.92. Last Cross Country season, Ratliff finished in 2nd place at the CCS Division IV race and continued her fine running with a 4th place finish at state. 1) What was your plan going into the Earlybird Invitational? Was there a time and/or place you were shooting for before the meet? How did the race unfold for you? What was your reaction when you saw the time? Previous PR on the course? I was going to base my goal time on the weather that day because it was supposed to be really hot during the race. By some stroke of luck, the day stayed relatively cool, even though it was slightly humid. With the good conditions and races unfolding, he (my coach, Greg Brock) told me that I should try for the course record. I really wasn't sure that I could do it, but after the first mile, having given myself a time cushion for the hilly second mile, I knew it was going to be good. I just hung on the last mile and gave it every last bit I had. I couldn't believe the clock as it approached 17 minutes, clocking 16:59.8 officially. My previous PR on the course was 18:00, so my first goal was to break that barrier, but I didn't know I'd break it by THAT much. 2) You ran the Wharf to Wharf during the summer. How many years have you run that race? What was your time this year and how long and difficult is the course?I've been running the Wharf to Wharf for about 5 or so years now. I love that race so much! The vibe is super laid-back and upbeat with bands playing the whole way and the locals cheering you on. Plus I love that distance. It really gets hard around mile four, but you go at a relatively steady pace the whole way so you just have to hang on and keep fighting and think of the reward. Pacing is key in a race like that. I ran the 6 mile road race this year in 33:55, which is about a 5:39 per mile average. 3) Looking back at your first 3 years of cross country and track and field in high school, what would you say were your proudest achievements and accomplishments?The accomplishment I've thrived off of most is my steady improvement all four years of my high school career. I definitely want to keep that going throughout my time running. Some standouts though where my win at the Crystal Springs Invitational last year and winning CCS finals in the 3200m by a hair last track season. 5) When did you get your start in running? What other sports have you participated in before and during high school?I've been running since my dad got us into it at a young age, probably around six or seven, where we would run little kids meet at the Soquel track every week in May. The more I improved, the more I liked the sport. I swam for about six years before running in high school, which I'd like to get back into after the cross country season is over. I also surf on the occasion. 6) Tell us a little about your coach Greg Brock and how he has helped you get to this point as a runner. Who else has had an impact on your success as a runner? Greg focuses on progression. I think he's done a pretty good job doing so considering my times throughout the years. My Earlybird time as a freshman was 20:46 and now its 16:59. I'd say that's some good progression right there. My dad has also played a huge part in my success. He's been pushing me since I was young, even though sometimes I wasn't big on our Sunday runs, but it taught me that hard, consistent work really does pay off. Jamey Harris has also been a mentor for high school kids in the area. He's an incredibly inspiring coach who can really get on a high school level of humor. 7) You compete in the SCCAL. Can you tell us a little about some of the competitors that have competed in that league over the past few years and how they helped you as competitors?Throughout the years, my main competitors have been Matti Peoples, Abbey Meck, Marea Zlatunich, and my own teammate Mari Friedman. They have all pushed me in more races than I can count. That has definitely made me a better runner. 8) What does a typical week look like for you with a Saturday invite? Any morning runs? Weight room work? Distance of long run? Pace of most of your easier runs? Who are your usual training partners? Tuesday- morning run and circuit in the am and a track workout in the pm. Thursday- morning jog and circuit in the am, hills or strides in the pm. I do some morning runs to escape the heat and I do a lot of circuit training. The circuit training I do with my team at school consists of upper body, like pull-ups and push-ups. The circuit I do at my house is mainly core and a bit of leg work. I do these on my own time. My coach is big on pull-ups. I think I really benefit from this sort of work. I typically do my long runs on Sundays. Long runs vary a lot, but usually around 11 or 12 miles. Usually we take it easy the day before invitationals with an easy shake out jog and strides. I do most of my runs with my new, up and coming team: Mari, Maya, Lila, and Anaya, along with some of the boys who want to join in. We all love running together. 9) Favorite XC course? Favorite XC meet? Favorite long run? Favorite XC workout? Favorite track distance? Favorite track invite? Favorite track workout? Favorite free time activity?My favorite xc course I think has got to be Woodward Park. All my memories on that course all full of excitement. I competed really well at the Crystal Springs Invitational last year, so I really like that meet. My favorite xc workout is probably the Prefontaine workout (The Prefontaine workout is usually a 5k where you run hard to 200m and easier for 200m, usually 38-48 second 200's. You run it straight through, no rest. You're recovery is the 48 second 200's. ), even though its probably the hardest thing ever. My favorite track event is the 3200m, hands down. The Stanford Invitational was really exciting, since it was my first time racing there last season. 1000m reps or 1200m reps are probably my favorite workouts for track. They're hard, but I think I get the most revenue out of distance repetitions. My favorite long run is in Butano State Park up Hwy 1. We sometimes stop at the Pie Ranch on the way home. They have the best pie I think I've ever tasted. I also love to cook as a past-time. 10) Your team just broke the team time record at Toro Park which bodes well for the rest of your season. Looking ahead at the rest of your season, what are some of the bigger races for your team? I have huge plans for the team this year. We just got two new transfers this year, one girl who was previously living in Denmark and one from Willow Glen in San Jose. We're doing the Stanford Invitational and I think if we all stay healthy, we'll place really well as a team. I definitely want to qualify for the state meet as a team this year and podium. I think breaking the team course record made my coach the happiest man in California. He was on cloud nine. He's been really wanting a team like this. 11) How much will running impact your choice for college? I definitely want to run in college and hopefully continue to improve there. I want to go to a school with a tight-knit, hard-working program, but whatever I decide to major in will also factor into my decision. 12) Anything else you would like to add.I can't wait to see what this season brings!